Nashville is seeing extreme growth, and with it, the skyline is changing. One local architect said that he does his best to create iconic buildings that are unique in the skyline, rather than blending in. 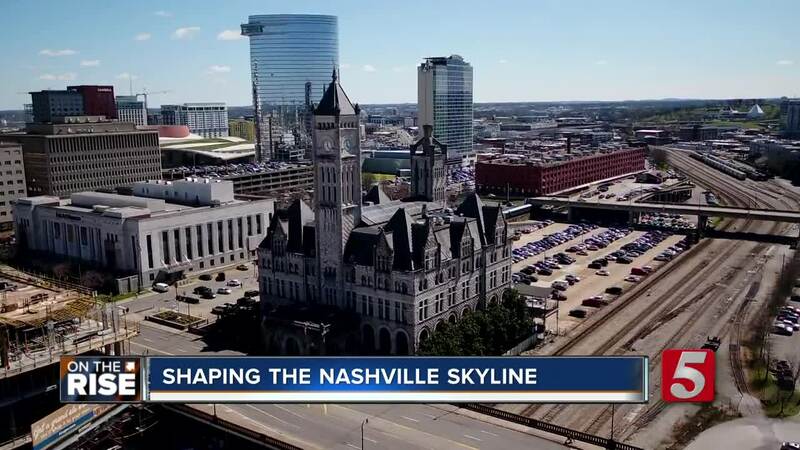 NASHVILLE, Tenn. — The Nashville skyline is changing faster than almost any skyline in the United States, and the skyline is shaped by architects who work with developers to make the new buildings a reality. With all the new construction, there’s the challenge to create something unique and iconic that will stand out. Bucher has worked on numerous projects in his more than 5 years at Gresham Smith, and his most recent project at the corner of 13th and Broadway was unveiled just a few weeks ago. GBT Realty Corporation is working to develop the space at 1221 Broadway into new office space, and Bucher was tasked with making it unique. He designed a more than 20-story office building made from glass, but with unique appointments to make it stand out. “As the sun comes around the city and comes over this building, because of the glass is faceted and angled, it’ll catch every single moment of that light quite a bit different,” Bucher explained. The project was one that the developers and Bucher were excited about, as it’s the building you’d see first if driving down Broadway into downtown. They call it the ‘gateway’ to Broadway, and they wanted to make sure it stood out rather than blended in. Construction on the 1221 Broadway project has already begun, with plans for the project to be complete sometime in 2020. While the hope is to impress people with the building upon completion, Bucher hopes that it will stand the test of time and be seen as an iconic building, with the likes of the AT&T Tower, or ‘Batman Building’ and Union Station. Bucher said beyond the look of the building from afar, architects focus on what it looks like from the ground level, how accessible a building can be, and how well it can be used by potential tenants.